A Baseball fashion shirt from Majestic the Cincinnati Reds Submariner T Shirt comes in Red Heather and is made from 7 oz. 60/40 Soft Cotton/Polyester Material with a loose-fit body to give you a comfortable fit. 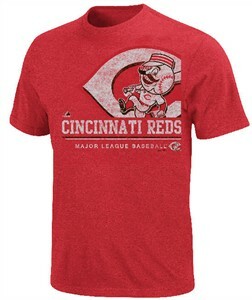 This short sleeve Cincinnati Tee is Officially Licensed by MLB and features a distressed front screened Reds and MLB specific graphic that has a Vintage or worn look.